The picture above shows the 1824 headstone, which stands next to the older stone, shown below. 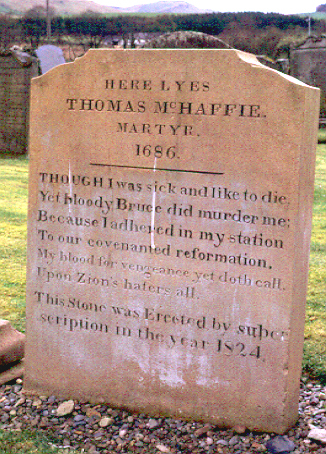 Here lies Thomas McHaffie, Martyr, 1686. 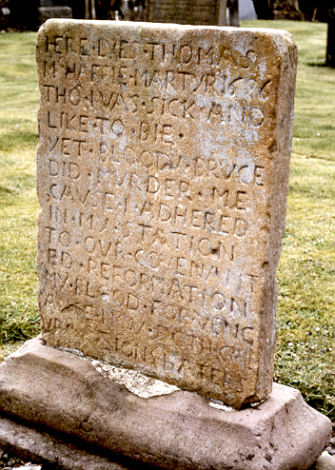 Thomas MacHaffie was son of the farmer at Largs, near the village. He had hid himself in a glen on the farm of Linfairn, but being seized with fever, and having taken refuge in a house near at hand, he was dragged out of his bed and shot on the road at the command of Bruce. It was 1686. The boulder where MacHaffie was shot is located near to Linfairn farm.